Pre-heat your grill to the desired temperature. Starting with the presentation side of the steak (the side that will be face up on the plate), carefully place the meat on to the grill and leave it undisturbed for about two minutes. Next, rotate the steak 90 degrees from its starting position and sear for another two minutes. Flip and repeat steps 3 and 4 to achieve the same pattern on the second side of the steak. 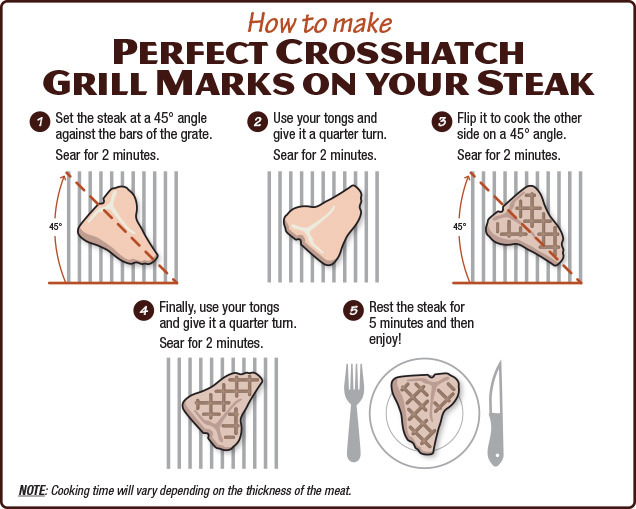 Once you know how to do it, it's easy to achieve those coveted grill marks that make all your friends and family jealous. Soon, you'll be the envy of the backyard BBQ!